Versions: Recorded with Access 2016. Most of the material should work with all versions of Access from 2003 on. Pre-Requisites: Access Advanced Level 6 strongly recommended, as you should watch all of my classes in order. However, if you're skipping around, you should have at least completed the Beginner series and the first 3 or 4 levels of the Expert series where I start to cover functions. This class begins our look at programming in Visual Basic for Applications in Microsoft Access (VBA, or Access VB). 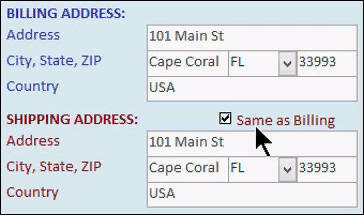 We will learn exactly what Visual Basic is, and what the different kinds of VB that are available do. 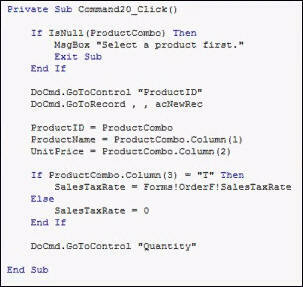 You will learn about the benefits of VBA over macro programming. 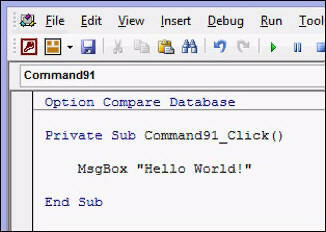 We assume you have no VBA programming experience, and will write our very first VBA code, making the computer say "Hello World!" which is a classic first program. You will learn the MsgBox command. You will learn about the DoCmd.OpenForm command which is used to open a form in Access. There are several options available and we'll cover some of those today. You will learn about the arguments list, where condition, how to open a specific record, and more. We'll learn how to write subroutines that have multiple commands in them. 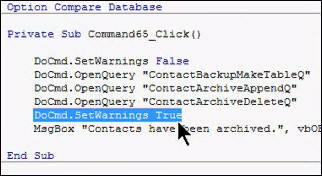 You'll learn about the SetWarnings and OpenQuery commands. Next we will recreate the "add product" button we designed with a macro back in the Expert series. We will learn about the If / Then / Else statement, GoToControl, and GoToRecord commands. Finally we're going to learn about the AfterUpdate event, and set up VBA code so that every time I update one of the customer's billing address fields, the corresponding shipping address field updates, if the box is checked. This is the 1st class in the Access Developer series. If you're serious about building quality databases with Access, and you want to learn how to automate your database with VBA Programming then don't miss out on this course. Of course, if you have any questions about whether or not this class is for you, please contact me. Richard on 6/7/2017: Access Developer 1 begins our in-depth study of Visual Basic for Applications programming with Microsoft Access (Access VBA). If you're serious about building quality databases with Access, and you want to learn how to automate your database with VBA, then don't miss out on this course. Contents include: - Introduction to Access VBA - Statements, Procedures, Parameters - DoCmd.OpenForm - Multiple Command Arguments - SetWarnings, OpenQuery - If / Then / Else Statements - GoToControl, GoToRecord - Add New Customer Button - AfterUpdate Events in VBA - Lots more Click here for more information on Access Developer 1, including a course outline, sample videos, and more. This course was recorded using Access 2016, but most of the topics covered are valid for all versions of Access from 2003 on. This class follows Advanced Level 6. The next course in the series is Access Developer 2. James G on 6/26/2017: You asked us to bug you about one lesson per week so.....a friendly reminder. Very much looking forward to the new Developer series. Thanks Richard. He must have heard you... D2 is out now. Some of the material from the original Access Developer Series will be covered again, much like all the other courses were from Beginner, Expert, Advanced. There will be new things covered but the old stuff is also there for people who haven't got those courses and starting fresh.